We had been married for few months when it started to get to me. Every newly married couple has experienced that time where you are getting accustomed, not only to the metaphysical ramifications of your marriage, "This is FOREVER," but also the every day habits of this new person. Sometimes, those two things are causally linked. Your spouse does something that annoys you and your immediate thought is "He's going to be doing this FOREVER." You've all seen my rug, so you know that I am not that particular when it comes to matters of the home, but for reasons I cannot explain, it gets to me when other people don't replace a used roll of toliet paper in the bathroom. I've been guilty of it myself, but am pretty unforgiving when others commit this transgression. So, like I said, it had been going on for a few months before I said anything. Not only was Mark not replacing the toliet paper, he wasn't even using up the whole roll before he'd get out a new one and place it on the the toliet tank! Oh, it irked me. Was it somehow beneath him to use up the last bits of a roll? Was that part inferior quality? Was he allergic to it? This wasn't Scott tissue we were talking about, this was double ply and since this was FOREVER all that money was really going to add up! Finally, one evening I decided to bring it up. Diplomacy has never been a strong suit of mine, although I like to think I have gotten better. This time I had rehearsed what I was going to say, and it was brilliant and bullet proof. Are you ready for it? 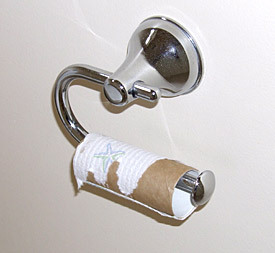 I asked him, "Why don't you use up the whole roll of toliet paper before getting out a new one?" His reply? "I do use it up, I get out the new one in case you are the next one to use the bathroom, so you won't have to get up in the middle to find another roll when you run out." Well that had never occurred to me! All this time, I had considered his actions as being any, and/or all of the above "wasteful, selfish, thoughtless, annoying." The possibility that he was doing this because he loved me hadn't even crossed my mind. So much for my bullet proof foray into diplomacy! This isn't the only time something like that has happened. I'll be angry because he is home late only to find out he was mailing a package for me, running an errand I have been meaning to take care of or filling my car up with gas. The last bit of ice cream goes stale, because he was saving it for me. He doesn't always do things like that for me, and I'm capable of doing them as well, but so often I have preconceived notions about how life is supposed to go, and how toliet paper is supposed to be used properly, I automatically assume malevolent intent and I don't let him love me the way he is trying to. At least I have forever to figure out how. For Ryan and I it was grocery shopping. He would come home missing stuff that he "couldn't find" and have 10 bottles of hand soap in a scent that made me gag! I don't do diplomacy very well either, so I am the grocery shopper now. I get to grocery shop FOREVER now. This made me smile, and so did the starfish TP! I love how you said we don't use starfish toilet paper in this family....just like we don't say shut up in this family...hahah.